In the mid-90s, I attended a Monkees concert at the Bloomsburg state fair. I went with some of my similarly-aged friends, and of course my Mom and one of her friends. We needed her to come because none of us were old enough to drive, but that wouldn’t have mattered. She wouldn’t have missed seeing one of her childhood idols in person for the world. So, we all drove to the fairgrounds that September night and thoroughly enjoyed the show. Born over a decade after the Monkees disbanded, I was a fan of the band. Having collected a couple of their albums before that point, I felt the group still resounded on my level, and that performance, featuring Mickey Dolenz and Davy Jones, stayed with me. Early on, I knew that one can’t question the power of a great song. I’m always surprised by that group. They had a string of some perfect pop songs, but what continues to impress me is their staying power. To anybody who pay attention to the artists that come and go in the world today as I do, it’s pretty fascinating that a group that was together for just a short time in the 60s could still be such a well-loved band today. 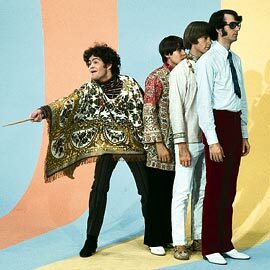 The Monkees started out in the mid-1960s with a TV show that was developed around the idea of a pop band’s hijinks. The audience loved it, despite the fact that for the first album or so, the group didn’t actually perform on the tracks that they released. However, as the show moved on, the band members took more control and started to perform and write their own tunes. And, it surprised many when the results were better than expected. People (still) loved the Monkees, and who could blame them? By this point, they had hits “Last Train to Clarksville”, “I’m a Believer”, “Pleasant Valley Sunday”, amongst others. During that timeframe, the Monkees had a friendly rapport with members of The Beatles. Often appearing during studio sessions of theirs or just plain hanging out. Either way, one can’t imagine more of a powerhouse than those two iconic bands in the same room. As the 60s came to an end, so did the Monkees. But over the years to come, the group members would make individual appearances, and occasionally tour together. What’s left today is a group who tours, without beloved lead singer Davy Jones, but they also continue their own solo endeavors. But what’s more important, and probably is what gives them the capability to still play all over the world, is that the music still stands up and continues to connect and create a new generation of fans.